In this frenetic collection of stories taken from the files of Nick Nightmare, Private Eye, the intrepid pulp hero is thrown into a murky world of crawling horrors, spawned by the Old Ones as they seek to rise up from their primordial oceanic depths, ‘when the stars are right.’ Whether he is shooting it out with power-crazed acolytes in his native New York, or slipping across into other dimensions to battle the spreading plague of invasion, Nightmare is never far from the long, clammy reach of the things from the Deep, bizarre artefacts of power, decrepit villages and citadels, magic and voodoo. Life for the private eye is an endless slalom of mayhem. Joining Nightmare are a host of weird characters, from the Sleaze Sisters, to Sharkbait Bill; the ageing but still potent superhero team, Vengeance Unlimited; and the extraordinary Monitifellini and his Magic Bus. There are the devious depravities of the Vogue Prince, the Bang Gang, and the frightful Spiderhead, to name but a few. Nick Nightmare Investigates includes a team-up with Damian Paladin in a brand new, full-blooded action thriller, written in collaboration with Mike Chinn. 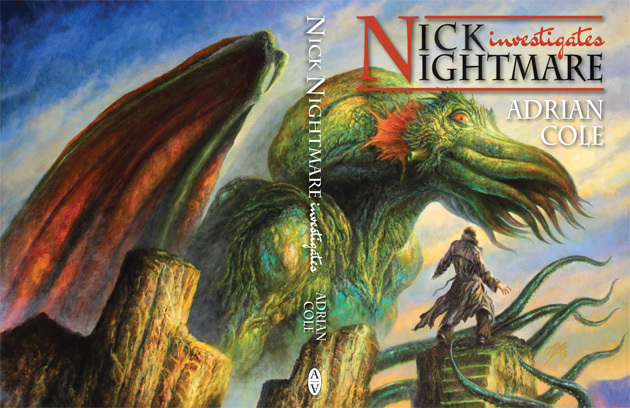 Nick Nightmare Investigates is a potent blend of HP Lovecraft, Mickey Spillane and the roller coaster adventures of the golden age of the pulps. Available as a signed, limited edition (200 copies only) hardcover from The Alchemy Press. Use the contact form to request further details or use the PayPal buttons below. Buy Nick Nightmare Investigates via PayPal.